I was working on a problem yesterday which involved relating some things to do with the perimeter and area of a triangle. However there were no angles involved and what I needed was a formula for the area without appealing to anything but the lengths of the sides. Thinking about it a bit, this should be possible because knowing the three sides is enough to uniquely define the triangle. 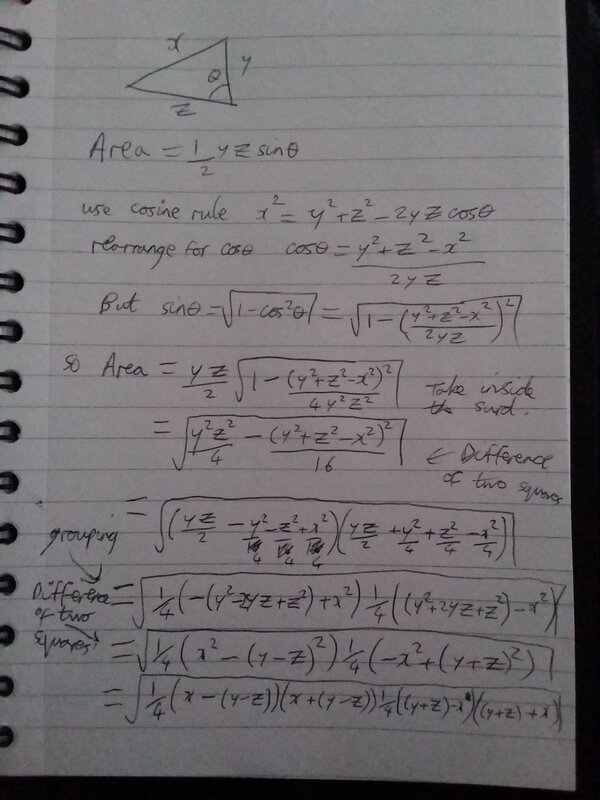 Obviously we already have a formula for right angle triangles which just involves side lengths, but for a general triangle we have the formula area=0.5yzcosθ where θ is the angle between the sides y and z. In order to eliminate the angle we could use the cosine rule. It turns out that the subsequent algebra devolves into a neat form called Heron's Formula which was derived by Hero of Alexandria (who has occurred on this website before in his capacity as an inventor). He was known as both Hero and Heron and I can't seem to work find a source on why.